A happy sunny weekend project. My lil brother Walt and I were just talking about yard sales and how we just cannot wait for the weather to be consistant enough for them to start popping up around town. He is on the market for "tools" and anything else that will up his "Man" cred. We joke with him daily about how he is such a "Man". He fills his freetime with motors, and spray cans, and wires, and hoses, and power washers, and trips to home depot ... and his favorite shop of all...Harbor Freight! (coincidentally, it's his girlfriend's least favorite.) It's so funny to me. Living with him is a riot...since Aaron is more the artist type...you know, dirty hands mean paint, not motor oil. This weekend Walt's manliness and schooling came in handy... (he is studying heating, cooling, air conditioning, and solar energy.) Our fridge, which happens to be a big stainless steel model that also "came with the house" , was acting up ... the freezer was much like the tundra and the fridge ... just a bit cooler than room temp. So Walt grabbed a big cooler... defrosted the freezer ... and quickly explained all sorts of manly tech mumbo jumbo about coils and insulation. So fastforward to today... he's now offering us all ICE COLD Orange Juice! So proud of himself ... and we are too. It's so hilarious because he's always been a little Mr. fixit . Since he's like 5 the go-to Christmas gift for Walty was a tool box with a can of WD40 included. Aaron and I found this piece of furniture for $8.00 last summer. At first Aaron wasn't too into it, but I thought it would be perfect in the bathroom. 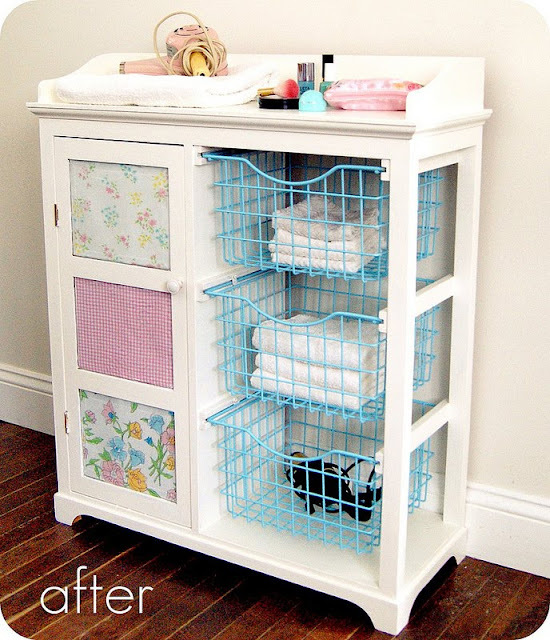 Those wire baskets are great for storing washcloths, hand towels, extra rolls of t.p., a flat iron or blowdryer. Well, fast forward to now...our new bathroom in our new place. The piece just so happens to be the EXACT size of this little space next to the sink...a perfect fit! We painted the bathroom a fresh clean white for now, but as soon as we have some free time we will be going with our Salt Water Taffy stripes again and vintage boardwalk and beach theme. All of our bathroom decor is still packed away but I think this fresh and happy piece will be the nudge we need to get going on digging that stuff out and really punching up the new bathroom. 1. We washed the entire piece with a cloth and warm soapy water. Dried it off completely. 2. Sanded the entire piece with light grit sand paper. Dusted with a cloth. 3. Painted with a primer/sealer such as Kilz. Let dry over night. 4. Painted with a satin finish paint. Dry 4 hrs, recoat. Of course if you wanted to seal it you could. But the satin paint we used had a lovely finish on it's own. 1. Wipe down with a paper towel and your favorite spray cleanser. 2. Spray with a can of primer. 3. Spray with your favorite can spray paint. Let dry an hour between coats. We did two coats. We decided to add some summery, beachy florals to the piece in the form of vintage sheets!...well actually, we made color copies of vintage floral sheets! It's super easy and super cute! Just cut to fit and tape inside behind the glass. And there we have it! A Happy new life! I swear, it seems as if this piece just stepped into Sunshine! right? Have you worked on any home projects lately? Any restyling? I'd love to see! Love it! Love the color of the baskets, very fresh!! Wow, what a huge difference! So cute!! 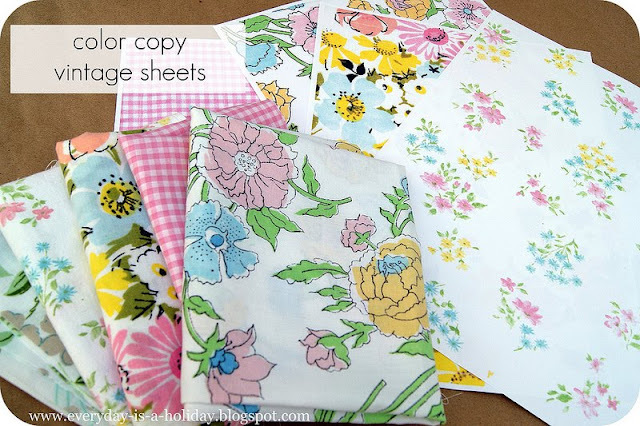 Also I love the idea of making color copies of vintage sheets!! I would have never thought of that.. I have a huge stash but I'm always so hesitant to use them for anything since they're one of a kind. Oh my goodness...you did an awesome job!! That thing is adorable!! Wow Jenny the before and after is just amazing! All the colors are so pretty and yummy! I'm so impressed! Thanks for sharing! This is SO fantastic! The revamping of it is so so perfect. I'm slightly jealous of your "new" piece of furniture! 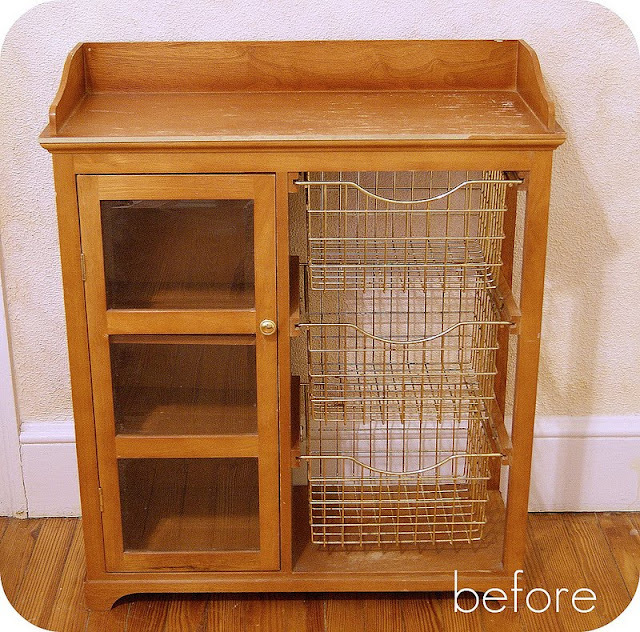 What a great find, and the revamp looks amazing :) The wire baskets are such a fun idea! ahh what a great idea, Jenny! This is beautiful. I am glad you like the old photo of my Great Great Grandfather :) That is hilarious that you collect "instant relatives".... it made me laugh. I love your spirit! I hope you have a wonderful day, beautiful woman! Everything looks like a sweet celebration of colors!! Love the work you made to that furniture! Thank you SO SO much sweet things!!! So lovely of you guys to pop in and leave me such nice words! I love it!!!! Love the colors you chose and fabrics! :) So bright and fun! Perfect diy! I can't wait to do something similar when I get my own place.. It is so fun and cheerful now! You have caused me to look at thrift store furniture in a whole new way now. Glad to have found your blog and this post. I love this! You did an amazing job. Thats actualy amazing! wish I was that creative! 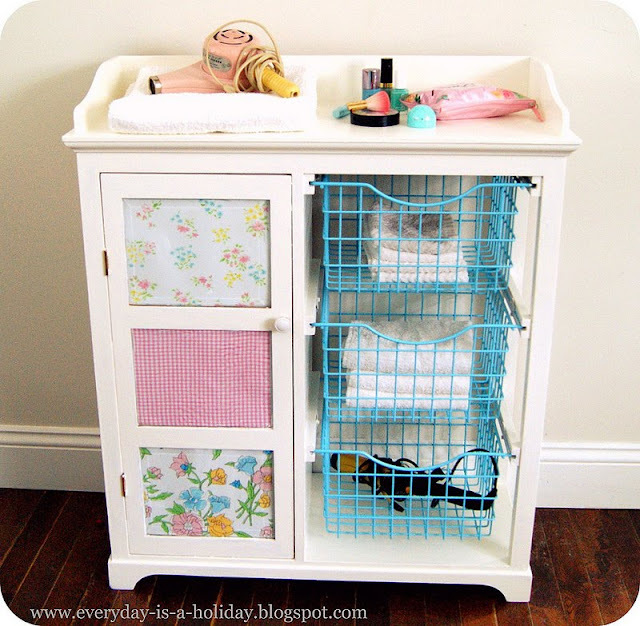 That is adorable--would make a perfect baby changing table. Love it! This is so cute - love it! Just found you on Someday Crafts and I would love if you shared this at my Creative nspirations linky party happening now! I absolutely love your makeover! It was a neat piece to begin but you made it so cute! Love the use of vintage sheets. so cute! I love using vintage sheets in projects!